The models strutted along the catwalk. 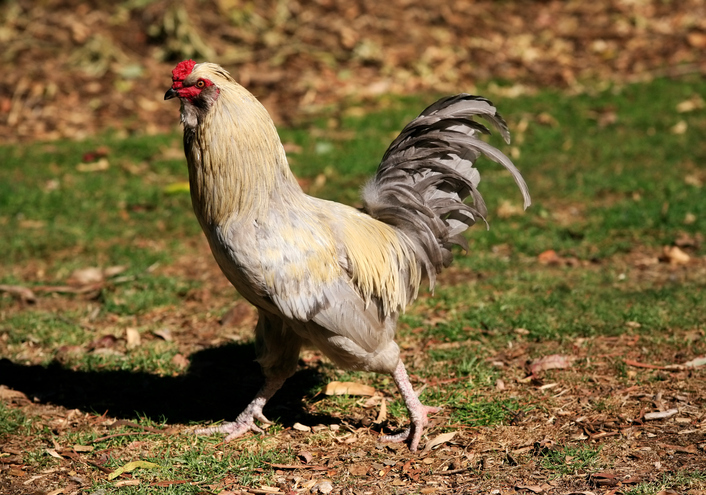 The rooster strutted across the farmyard. The young man's strut made him look pompous. The structure was supported by struts at regular intervals. The arches were strutted to make them stable. Early meanings of the verb to strut were about swelling, bulging, or protruding, and we still get a sense of that in the modern meaning. When someone struts, the gait is quite specific, with stiff legs and chest puffed out, rather like birds walk, especially male birds when they are trying to impress female bird or squaring up for a fight. When someone struts, their gait suggests pride; it is rather like some of the movements in flamenco or tango dancing. Strut dates back to before the year 1000. The Old English verb strūtian originally meant ‘to stand out stiffly, swell or bulge out,’ as well as, figuratively, ‘to exhort yourself or struggle.’ It can be traced back to the Proto-Germanic root strut- and the Proto-Indo-European root ster- (stiff). It is related to the Danish strutte and the German strotzen (to be puffed up or swelled) and the German Strauß (fight). Through the PIE root, it is also distantly related to many English (as well as foreign) words, including start, stare, starch, stark, startle, starve, stern, stork, stereo and even torpedo. In Middle English, the verb, now strouten, also had a different meaning: ‘to display or flaunt your clothes proudly or vainly,’ which had overtaken the Old English meaning by the late 14th century. The meaning continued to evolve, expanding to describe a person’s air or attitude, and then, in the early 16th century, their walk. The sense ‘to walk in a vain, important manner, or with affected dignity,’ is recorded from the late 16th century. The expression to strut your stuff first appeared in the 1920s. The noun, meaning ‘an affected, vain manner of walking,’ dates back to around the year 1600, and comes from the verb. The noun strut, used in construction and engineering to mean ‘supporting brace,’ dates back to the late 16th century. Its origin is uncertain, but most linguists believe it may have come from a Scandinavian or Low German source, and point to the Norwegian strut (a nozzle or spout) and the Low German strutt (rigid) as possible related words. Either way, the origin can be traced back to the Proto-Germanic word strutoz-, from the root strut-, just like the verb.